The area's earliest settlers were Frenchmen who arrived here in 1785 from Nova Scotia. However, they did not stay and soon moved on to the upper regions of the St. John River and lower Canada. There is also evidence of early German settlers. Lubec was incorporated in 1811 and named after the old German city of Lubeck. The first permanent settlers were Louis Delesdernier and Nehemiah Small, who also were the first traders at Flagg's Point where Lubec Village now stands. A Congregational church was organized here in 1820 with others following. Lubec and Eastern Maine feature an extreme oceanic climate with cool temperatures, wind and fog. Fog forms frequently when warm, moist air meets cold air here. However, Washington County does not have the severe snowfalls or frigid cold of the northern regions. The coast does get a lot of rain, ice and snow. Summers along Maine's eastern seaboard are very mild, with chilly nights and daytime highs rarely going above 80 degrees. Lubec is served by the Lubec Consolidated School. Area colleges and universities include the University of Maine, University of Maine at Machias, the University of Maine at Orono, College of the Atlantic, Maine Maritime Academy, Community College - Calais, University of Southern Maine and others. Hospitals near Lubec include the Down East Community Hospital, Calais Regional Hospital, Maine Coast Memorial Hospital, Eastern Maine Medical Center, and others. Many events and festivals can be found in Lubec and Washington County. You are sure to enjoy Indian Days, the annual Blueberry Festival, the Salmon Festival, the Lubec Fall Festival, annual Down East Spring Birding Festival, the West Quoddy Head Light Keepers, the Mary Potterton Memorial Concert Series and much more. There's a wealth of outdoor activities to fit the needs and desires of just about everyone here! While Washington County is truly one of the most beautiful areas of the state, it is mostly undeveloped and one of the best kept secrets around. Enjoy some of the best fishing and hunting in the entire state right here! Area salmon rivers include the Machias, Dennys, Narraguagus and Pleasant rivers. The Fundy Bay boast some of the world's largest tides. 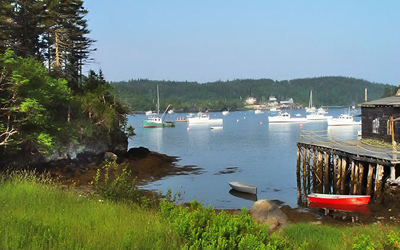 In Lubec, they range from 18' to 22' tides providing abundant fishing. You'll reel in big trout, yellow perch, bass and pickerel. As soon as spring melts the ice, Grand Lake Stream, West Grand Lake, Pocumcus Lake and Big Lake offer outstanding trolling. Grand Lake Stream is also known as a premier fly-fishing stream for landlocked salmon. May and June make all the fly-fisherman's dreams come true on area streams, lakes and ponds in the area. 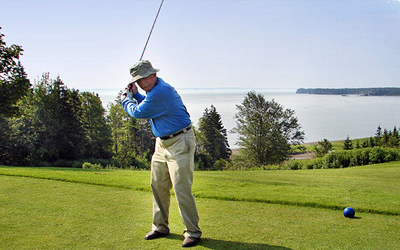 For the duffer, there are 4 golf courses within easy driving distance of Lubec. Whether you're here for a great vacation or for a permanent change of lifestyle, Lubec and Washington County could hold the keys to your future.